Nigel Worthington (born 4 November 1961) is a Northern Irish former professional footballer who was most recently the manager of York City. He played a defender and a midfielder, playing his club football for Ballymena United, Notts County, Sheffield Wednesday, Leeds United, Stoke City and Blackpool. With Sheffield Wednesday he won the League Cup in 1991. As an international player, he was capped 66 times for Northern Ireland, and appeared for them at the 1986 FIFA World Cup. Worthington began his managerial career as player-manager of Blackpool in 1997 before he took over as manager of Norwich City in 2000. He guided Norwich into the Premier League in the 2003–04 season as First Division title winners. He left just over two years afterwards, having failed to keep them in the top-flight in 2005. He was briefly caretaker manager of Leicester City in 2007 prior to starting as manager of Northern Ireland, from which he stepped down in 2011. Born in Ballymena, County Antrim, Worthington played as a left-back and a midfielder and started his career with hometown team Ballymena United in 1979, where he was Ulster Football Writers Young Player of the Year in 1981. He moved into English football with Notts County on 1 July 1981 for a £100,000 fee. Worthington signed for Sheffield Wednesday on 6 February 1984 for a £125,000 fee, and he stayed at the club for over 10 years. He earned promotion into the First Division with Wednesday in the 1983–84 season as Second Division runners-up. He was a member of the team that won the League Cup as well as a return into the First Division after finishing in third place in the Second Division in 1990–91. Two years later, Worthington and his teammates were losing finalists in the 1993 FA Cup Final. Worthington left Wednesday to sign for Leeds United on 4 July 1994 for a £325,000 fee, spending two seasons at the club and one season at Stoke City, after signing on a free transfer on 18 July 1996. Worthington was capped 14 times by the Northern Ireland national under-18 team before making his debut for the senior national team in a 1–1 draw away to Wales in the 1983–84 British Home Championship on 22 May 1984. This was notable for being Northern Ireland's final match in the last ever British Home Championship, the point gained being enough for Northern Ireland to win, and keep in perpetuity, the trophy. In Northern Ireland's subsequent successful qualifying campaign for the 1986 FIFA World Cup, Worthington started one qualifying match and came on as a substitute in three more. In the Finals tournament itself, Worthington started two of Northern Ireland's three matches, against Algeria and Spain. He served as Northern Ireland captain from 1995 to 1996. Worthington's 66th and final cap was gained in Northern Ireland's 3–0 victory in a home friendly against Belgium on 11 February 1997. Worthington's managerial career started as the player-manager at Blackpool on 8 July 1997. He soon retired from playing to take on sole managerial duties, but two and a half seasons in charge ended with his resignation on 23 December 1999 following a dip in form that saw the club lying in the Second Division relegation battle. "I have taken the club as far as I can," he stated. After acting as assistant to Howard Wilkinson with the England under-21 team, Worthington moved to Norwich City on 27 June 2000 as assistant to Bryan Hamilton. He was given the role of assistant manager for the Northern Ireland national under-21 team on 22 August 2000, which he shared with his duties at Norwich. He was appointed caretaker manager at Norwich on 4 December 2000 after Hamilton resigned and on 2 January 2001 was appointed as permanent manager. He later saved the club from relegation into the Second Division. The 2001–02 season, Worthington's first full season, saw Norwich reach the 2002 First Division play-off Final, in which they lost to Birmingham City in a penalty shoot-out. In his third full season in charge, 2003–04, Worthington took Norwich into the Premier League after winning the First Division championship with a club record 94 points. With one match remaining in 2004–05, Norwich were one point above the relegation zone, but after a 6–0 defeat by Fulham were relegated in 19th place. Norwich were tipped to make an instant return into the Premier League in 2005–06 having retained the majority of their squad. The team failed to mount the expected promotion challenge, which led to some supporters calling for Worthington to leave the club, with Norwich finishing the season ninth in the Championship table. After a defeat to Plymouth Argyle early in September 2006, Norwich's majority shareholders, Delia Smith and Michael Wynn-Jones, released a statement expecting Worthington to improve the team's performance in the following matches. Worthington was sacked by Norwich almost immediately after a 4–1 defeat to Burnley on 1 October 2006, a result that left the team 17th in the table. Worthington was appointed caretaker manager of relegation threatened Championship club Leicester City for the rest of 2006–07 on 11 April 2007. Despite losing his first match to former club Norwich, he was able to steer Leicester to safety and stated his desire to become Leicester's permanent manager. He lost out on the position to Martin Allen. Worthington was appointed as manager of Northern Ireland on 1 June 2007, initially on a short-term contract until the end of the UEFA Euro 2008 qualifying campaign in November. At the time of his appointment, Northern Ireland led their qualification group. Although Northern Ireland eventually finished third in their qualification group, the Irish Football Association gave Worthington a two-year contract in January 2008. This was subsequently renewed in January 2010, lasting until the end of the UEFA Euro 2012 qualifying campaign. However, after a poor UEFA Euro 2012 qualification campaign he stepped down on 11 October 2011 after the final qualifier against Italy. 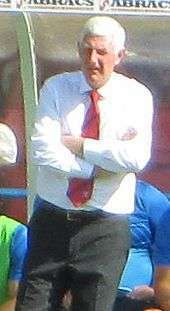 Worthington was appointed manager of League Two club York City on 4 March 2013, after Gary Mills was sacked two days earlier. His first match in charge was a 3–2 defeat away to AFC Wimbledon on 9 March 2013. On the last day of the season, 27 April 2013, York won 1–0 away to Dagenham & Redbridge, which secured the club's League Two status, finishing the season in 17th place. He signed a new one-year rolling contract with York on 3 May 2013. Worthington managed the team that reached the League Two play-offs in 2013–14, in which York were beaten 1–0 on aggregate in the semi-final by Fleetwood Town. He resigned as York manager on 13 October 2014 with the team one place above the relegation zone, and was quoted as saying "In recent weeks, performances have not been up to my high standards and I take full responsibility for this". Worthington married Sandra Hopkins in Nottingham, Nottinghamshire during the second quarter of 1983. His cousin is fellow manager Brendan Rodgers. 1 2 3 4 5 6 Hugman, Barry J., ed. (1998). The 1998–99 Official PFA Footballers Factfile. Harpenden: Queen Anne Press. pp. 332–333. ISBN 978-1-85291-588-9. 1 2 3 4 "Nigel Worthington". NIFG. 11 April 2007. Retrieved 3 March 2013. ↑ "Ex-Sky Blue gets top job". Ballymena United F.C. 1 June 2007. Archived from the original on 2 November 2007. 1 2 3 4 5 6 "Profile of Nigel Worthington". Irish Football Association. Retrieved 3 March 2013. 1 2 Rollin, Jack, ed. (1991). Rothmans Football Yearbook 1991–92. London: Queen Anne Press. pp. 462–463, 620–625, 629, 652–653. ISBN 978-0-356-19198-0. ↑ Reyes, Macario; Morrison, Neil (1 October 2009). "British Home Championship overview". Rec.Sport.Soccer Statistics Foundation. Retrieved 3 March 2013. 1 2 3 4 5 6 7 "Managers: Nigel Worthington". Soccerbase. Centurycomm. Retrieved 23 September 2015. 1 2 Gillatt, Peter (2009). Blackpool FC On This Day: History, Facts and Figures from Every Day of the Year. Pitch Publishing. ISBN 1-905411-50-2. 1 2 "Nigel Worthington". Flown From the Nest. Retrieved 3 March 2013. ↑ "Worthington handed Norwich chance". BBC Sport. 2 January 2001. Retrieved 18 September 2016. 1 2 Wiltshire, Lewis (4 May 2004). "Worthy cause for a party". BBC Sport. Retrieved 18 September 2016. ↑ "Birmingham reach Premiership". BBC Sport. 12 May 2002. Retrieved 18 September 2016. ↑ Cuffley, David (20 January 2010). "A record-breaking start – but what of City's finish?". Norwich Evening News. Retrieved 18 September 2016. ↑ "Norwich City 2004–2005: Table: 11.05.2005". Statto Organisation. Retrieved 18 September 2016. ↑ "Fulham 6–0 Norwich". BBC Sport. 15 May 2005. Retrieved 18 September 2016. ↑ "Norwich City 2004–2005: Table: Final table". Statto Organisation. Retrieved 18 September 2016. ↑ "The Championship form guide". BBC Sport. 1 August 2005. Retrieved 18 September 2016. ↑ "Supporters' meeting calls for change at the top". BBC Norfolk. 6 March 2006. Retrieved 2 February 2008. ↑ "Norwich City 2005–2006: Table: Final table". Statto Organisation. Retrieved 3 March 2013. ↑ "Owners blast Norwich performance". BBC Sport. 25 September 2006. Retrieved 18 September 2016. 1 2 "Norwich sack manager Worthington". BBC Sport. 1 October 2006. Retrieved 18 September 2016. 1 2 "Worthington takes Leicester job". BBC Sport. 11 April 2007. Retrieved 18 September 2016. ↑ "Worthington awaits Foxes decision". BBC Sport. 2 May 2007. Retrieved 18 September 2016. ↑ "Allen named new Leicester manager". BBC Sport. 25 May 2007. Retrieved 18 September 2016. 1 2 "Worthington named N Ireland boss". BBC Sport. 1 June 2007. Retrieved 18 September 2016. ↑ "IFA to name Worthington as boss". BBC Sport. 7 January 2008. Retrieved 18 September 2016. ↑ "Worthington agrees new contract". FIFA. 14 January 2010. Archived from the original on 10 November 2012. 1 2 "Nigel Worthington to step down as N Ireland manager". BBC Sport. 10 October 2011. Retrieved 18 September 2016. ↑ "Nigel Worthington named York City manager". BBC Sport. 4 March 2013. Retrieved 18 September 2016. ↑ "AFC Wimbledon 3–2 York". BBC Sport. 9 March 2013. Retrieved 18 September 2016. ↑ "Dag and Red 0–1 York". BBC Sport. 27 April 2013. Retrieved 18 September 2016. ↑ "Nigel Worthington extends York City contract". BBC Sport. 3 May 2013. Retrieved 18 September 2016. ↑ Lewis, Stephen (13 May 2013). "Why it's a City life for Sophie Hicks". The Press. York. Retrieved 1 December 2013. ↑ Cartwright, Phil (16 May 2014). "Fleetwood 0–0 York". BBC Sport. Retrieved 18 September 2016. ↑ "Nigel Worthington resigns as York City manager". BBC Sport. 13 October 2014. Retrieved 18 September 2016. ↑ "England & Wales marriages 1837–2008 transcription". Nigel Worthington. Marriage quarter: 2. Marriage year: 1983. District: Nottingham. County: Nottinghamshire. Volume: 8. Page: 1046. Retrieved 13 November 2015 – via Findmypast. (subscription required (help)). ↑ "Ex Northern Ireland manager Nigel Worthington backs his compatriot – and cousin – Brendan Rodgers to succeed at Liverpool FC". Liverpool Echo. 31 May 2012. Retrieved 1 December 2013. ↑ Rollin, Jack, ed. (1982). Rothmans Football Yearbook 1982–83. London: Queen Anne Press. pp. 270–271, 458–461. ISBN 978-0-356-07888-5. ↑ Williams, Tony, ed. (1983). Rothmans Football Yearbook 1983–84. London: Queen Anne Press. pp. 264–265, 507–514, 544–547. ISBN 978-0-356-09727-5. ↑ Dunk, Peter, ed. (1984). Rothmans Football Yearbook 1984–85. London: Queen Anne Press. pp. 262–263, 439–446, 470. ISBN 978-0-356-10446-1. ↑ Dunk (ed.). Rothmans Football Yearbook 1984–85. pp. 322–232. ↑ Dunk, Peter, ed. (1985). Rothmans Football Yearbook 1985–86. London: Queen Anne Press. pp. 322–323, 440–446, 470–474. ISBN 978-0-356-10872-8. ↑ Dunk, Peter, ed. (1986). Rothmans Football Yearbook 1986–87. London: Queen Anne Press. pp. 322–323, 477. ISBN 978-0-356-12334-9. ↑ Dunk, Peter, ed. (1987). Rothmans Football Yearbook 1987–88. London: Queen Anne Press. pp. 326–327, 451–455, 459, 486–489. ISBN 978-0-356-14354-5. ↑ Rollin, Jack, ed. (1988). Rothmans Football Yearbook 1988–89. London: Queen Anne Press. pp. 326–327, 449–455, 457, 483–484. ISBN 978-0-356-15880-8. ↑ Rollin, Jack, ed. (1989). Rothmans Football Yearbook 1989–90. London: Queen Anne Press. pp. 467–469, 623–626. ISBN 978-0-356-17910-0. ↑ Rollin, Jack, ed. (1990). Rothmans Football Yearbook 1990–91. London: Queen Anne Press. pp. 488–489, 645–648, 652–653, 674–676. ISBN 978-0-356-17911-7. ↑ Rollin, Jack, ed. (1992). Rothmans Football Yearbook 1992–93. London: Headline Publishing Group. pp. 468–469, 628–632, 639, 665–667. ISBN 978-0-7472-7905-1. ↑ Rollin, Jack, ed. (1993). Rothmans Football Yearbook 1993–94. London: Headline Publishing Group. pp. 460–461, 621–627, 662–665, 919–920. ISBN 978-0-7472-7895-5. ↑ Rollin, Jack, ed. (1994). Rothmans Football Yearbook 1994–95. London: Headline Publishing Group. pp. 454–455, 625–626, 661. ISBN 978-0-7472-7857-3. ↑ Rollin, Jack, ed. (1995). Rothmans Football Yearbook 1995–96. London: Headline Publishing Group. pp. 196–197, 583–585, 614–617. ISBN 978-0-7472-7823-8. ↑ Rollin, Glenda, ed. (1996). Rothmans Football Yearbook 1996–97. London: Headline Publishing Group. pp. 196–197, 576–580, 606–607. ISBN 978-0-7472-7781-1. ↑ "Games played by Nigel Worthington in 1996/1997". Soccerbase. Centurycomm. Retrieved 18 September 2016. ↑ "Games played by Nigel Worthington in 1997/1998". Soccerbase. Centurycomm. Retrieved 18 September 2016. ↑ "Worthington, Nigel". National Football Teams. Retrieved 18 September 2016. 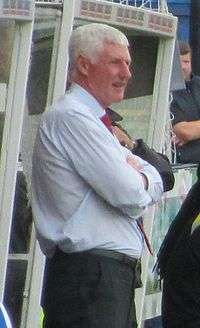 Wikimedia Commons has media related to Nigel Worthington.